Info "I took the trash out last time. It's your turn!" Trash Day is one of Dr. Crygor's microgames in WarioWare: Twisted! The game's purpose is to get the trash out of the trash can. To do so, the player has to rotate it by using the Game Boy Advance's tilting ability. If all the trash is out, the game is won. 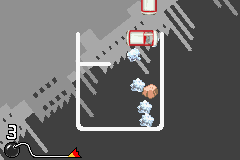 2nd level difficulty: A white bar in the trash can blocks the trash's way. 3rd level difficulty: Two white bars in the trash can block the trash's way. This page was last edited on September 26, 2018, at 23:26.